Experts predict advanced satellites will revolutionize crime fighting. British firm SA Catapult supplied technology to British police investigating a murder case. 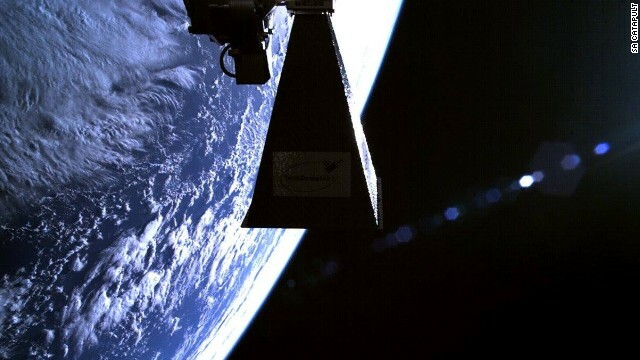 Pictured, its TechDemoSat-1 satellite celebrates a successful LEOP (Launch and Early Orbit) phase with a selfie. "We see this technology as taking us into the next generation of crime investigation. For me it's a 'wow factor' to have assistance from a satellite in space rather than using a spade on the ground. This is moving forward." "The satellite was sensitive enough to pick up a rabbit hole under bushes, and the disturbance caused by shotgun shells used in clay pigeon shooting." "People for so long, for so many generations, thought that privacy was just a given. 'Well I'm born, I'm a human, I don't see anyone around me so I have privacy. And don't come into my home without a warrant, because I have privacy'. Well, those days are so gone that it's not even funny. They have a van that drives down the street that can look inside your house. They have TV's that monitor the conversation you are having in your living room." (CNN) -- Months after the murder of Rania Alayed, the search for her body had ground to a halt. Although her husband -- who had admitted to her killing -- indicated the approximate location where he buried the body off a highway near Manchester, northern England, police were still left with miles of open field to dig through. Frustrated with the high cost and lack of progress, investigators turned to an experimental form of satellite imaging. "We had been using aerial photography, and the opportunity came up to look at a larger expanse," said detective superintendent Peter Marsh, of Greater Manchester Police. "It allowed us to identify anomalies on the ground, which we could search straight away." The satellite was sensitive enough to pick up a rabbit hole under bushes, and the disturbance caused by shotgun shells used in clay pigeon shooting. By systematically eliminating possible sites of the grave, police say their eye in the sky has saved them months of fruitless work. The search for Alayed's body is ongoing, but Marsh believes a significant breakthrough has been made. Satellites have been used in criminal investigations before. The Australian authorities have used them for over a decade in cases of illegal logging, for example. But technology advances are now enabling far more accurate and reliable imagery that could revolutionize 21st-century policing, transforming law enforcement capacity through highly detailed surveillance. "Even five years ago the pixel resolution was one meter at best, with most sensors in the two to five-meter range," says Dr. Richard Hilton, senior Earth observation specialist at Satellite Applications Catapult, the British company that supplied their technology to the Alayed case. "This year we have 30cm resolution, which dramatically changes the potential for detecting things, or monitoring a site of interest." The Alayed case is one of several pilot schemes the company is running with police forces and security agencies. A key focus is on organized crime, trafficking and smuggling. The satellites have been put to work on the illegal fishing industry, worth up to $23 billion a year, tracking ships to witness crimes in real time. "We can identify a specific ship and monitor its behaviour from port to port. We can see if it meets another vessel in a strange way and offloads cargo, or fishes in water it's not allowed to," says Hilton. In addition to improved resolution, SA Catapult is benefiting from a steady increase in the number of Earth observation satellites, with launches set to double over the next decade, making more data available as well as bringing down the cost. This progress is also enabling the growth of rivals such as U.S. firm Digital Globe, while the Asian market is also expanding. Some experts believe space surveillance could become industry standard. "The technologies that Catapult is developing will have broad application not only for national and international police organizations but also for anyone working in international security," said Patricia Lewis, research director of International Security at think tank Chatham House. Drug trafficking and arms reduction treaties are among the priority applications, says Lewis. It will soon be cost effective for police forces to buy their own satellites, predicts Ray Purdy, expert on satellites and the law at University College London. Purdy has been able to monitor criminal activity -- such as large-scale illegal waste disposal -- through satellite surveillance, which would have allowed police to cheaply and easily strengthen existing cases. "I've gone back and looked at crimes after a prosecution and in some cases you can see illegal activity a year before, which could have allowed a greater conviction," he said. "In other cases we found people resumed criminal activity immediately after they were prosecuted." However, whether satellite pictures are legally admissible remains unclear, as it requires expert interpretation, and has been stricken from the record in some previous cases. But as resolution steadily improves toward the point of being able to identify individuals, the industry will face ethical challenges over privacy. Purdy, who is preparing a research paper on the subject, says he is concerned. "Most satellites are commercially owned, so if you have money you can buy that imagery. It means anyone can spy on anyone ...The big thing is this development has happened without any debate on privacy and once the technology is out of the bottle it's hard to go back." Purdy wants to see a full public consultation and a set of standards established for the use of satellites in criminal cases, so that they are not introduced by stealth. But despite the questions that remain unanswered, the age of satellite crime fighting has already arrived. 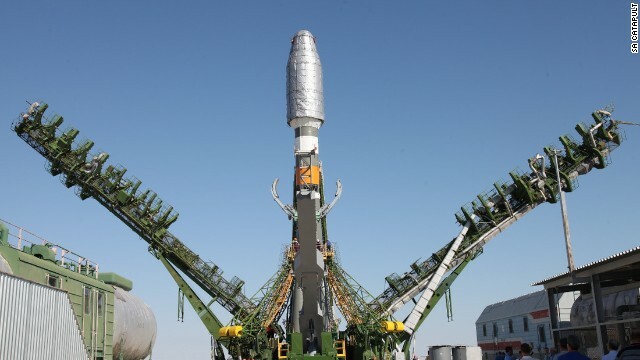 Pictured, the launch of the Earth Observation Satellite Soyuz 2, which is being used by SA Catapult.